​​What Does A Mosquito Bite Look Like? Summer is the season for shorts and t-shirts, BBQs, and get-togethers. It’s a time where we love to spend the few hours before dusk sitting in the yard enjoying the early evening. That is until we hear that familiar buzz and feel that itchy sting, then all the joy is ruined. There is a whole world of pests which all emit a buzzing sound, so how do you know what bit you? It can be alarming to wake up the next morning seeing an unknown bump on your arm. However, many of us shake the worry off and convince ourselves it was a mere mosquito, but what do mosquito bites actually look like? We all know and hate these flying pests. They are everywhere—inside, outside, by the water, and in our yards—once they sense a meal, nothing will stop them. To help you identify that itchy bump on your skin, I’ve put together this little guide. What Are Common Visible Characteristics of a Mosquito Bite? What Are Other Possible Symptoms of a Mosquito Bite? What Other Insect Bites Look Like Mosquito Bites? A mosquito bite will look different on every person. It all depends on how the chemicals injected are processed in the system of that particular body. There are those who may not even feel it; this could include young children or adults who have never experienced a bite before. On the other hand, this also applies to some who have been bitten so often that they have become immune. Some unlucky people, however, experience a more severe reaction. This generally involves those with a weakened immune system, and again, young children or adults who've never been bitten before but are highly sensitive. However, for most us, the typical characteristics of the bite will look like an inflated white spot with a surrounding red area. After a few minutes, a small bump will appear, giving that signature look. The size will vary, depending on the person, but it is generally the size of a dime. If you did scratch it, it would likely swell further, creating more discomfort. Even dogs will usually present with the same symptoms. A mosquito bite reaction will typically last from a few hours to a couple of days. How you treat it will dramatically influence the outcome. One of the big no-nos is scratching. This will only create more harm, so don't try to remove or puncture it. For treatment, you can use shop-bought products, or one of the many tried-and-tested natural mosquito bite remedies. When a mosquito bites, it causes a chemical reaction in the area. As the female mosquito finds her blood meal, she will start by implanting her mouth into a tiny vein. She will hold this position for six seconds, where she injects a chemical into the area, through her saliva, before feasting on the blood. Usually, our bodies are designed to clot any blood trying to escape, which would make it impossible for the mosquito to feast on it. However, the chemical our female friend is injecting will prevent this from happening, enabling her to continue eating instead. An alarm system quickly goes off within the area, which evokes an immune response to stop the blood from escaping. 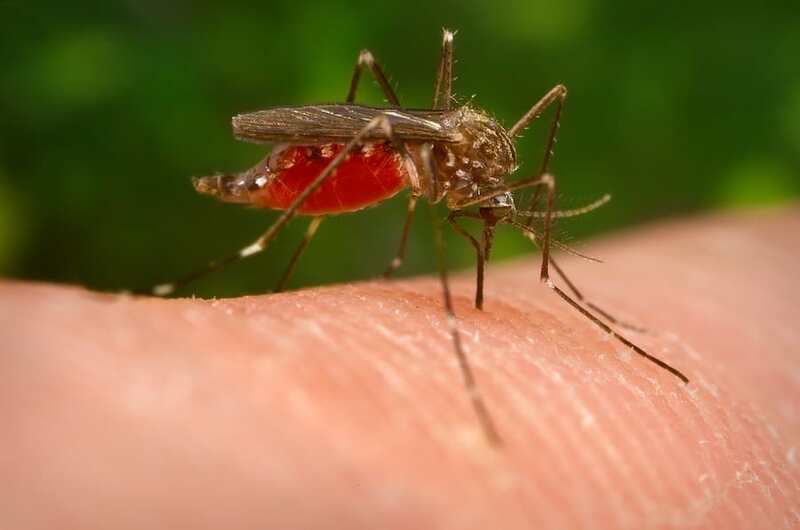 This creates that signature mosquito bite appearance—a reddish swelling, with a sometimes-overwhelming itching sensation, which you can attempt to soothe if it gets too much. Will a Disease-Borne Mosquito Bite Look Different? We are all well aware of the diseases a mosquito can carry—dengue fever, malaria, Zika virus, or yellow fever, among many others. This tiny insect is not as benign as it may seem. If you are unfortunate enough to be bitten by a mosquito carrying a disease, chances are you will develop the particular symptoms of that specific disease. However, you won't notice anything different from the bite itself. As mentioned above, everyone responds differently to a mosquito bite. It’s not unheard of for some people to experience a harder, darker spot, where a brownish bulge will appear. Some individuals may develop several of these bumps within a few days of the bite. This may feel alarming, but it is completely normal. These will also itch, just as a classic bite would. As opposed to a hard bump, other groups may experience blisters or a rash instead of the bulges. These are usually signs of a more severe reaction such as allergy, but generally not a cause for concern as long as you're prepared. Another symptom which most of us wouldn't necessarily associate with a mosquito bite is bruising. This is not a result of physical abuse from the mosquito, but rather a sign that your body is not reacting as well as it should to the effects. Bruises, as well as blisters, are general signs that you might be over-sensitive to mosquitoes. These two symptoms typically affect those with a compromised immune system. These symptoms are, however, treatable, so don't worry just yet. If you spend most of your summertime outdoors, or you know that your physical defenses aren't as they should be, make sure you are prepared. Apply repellent and wear clothing that covers any exposed areas. If you've developed blisters, avoid popping them, as this could lead to infections. Keep them dry and clean by washing with soap and water, and dry gently with a fresh towel. Bruises and blisters in many cases only skim the surface of adverse reactions to mosquito bites. Young children, individuals with weak immune systems, and adults exposed to a new species of mosquitoes may experience a whole different situation. While it still depends on the individual, some may develop blistering lesions or widespread hives. Fever can accompany the outbreaks, but may vary in intensity. Generally, children are the most vulnerable to these effects, so taking precautions is essential before venturing out on that family camping trip. However, in the worst-case scenario, you could develop a very serious reaction, called anaphylaxis. This condition is potentially life-threatening if not treated, as it will cause swelling near the airways in the throat. If not treated, the victim will begin to feel faint. Wheezing will likely follow, as the throat is closing and it becomes harder to breathe. Fortunately, it’s not so commonly seen from mosquito bites, but I still feel it's essential to mention seeing that it can happen. My advice is to consult an allergy specialist. These experts can check if you are potentially at risk and may prescribe auto-injectable epinephrine. This injection will help calm the effects and may just save you while on the trail in no man's land. Bug and mosquito bites can look familiar at times, which can be quite confusing. However, if you're looking to call the pest control, it’s vital to know what your home is infested with. Probably the closest resemblance to a mosquito bite is the bite from a bed bug. These can cause bumps and marks similar to our flying enemy’s bite. Because of this, you should trace your steps from the night. Inspect your mattress for signs of bed bugs, or consider if you left a window open. Another thing to remember if you're in between bed bugs and mosquitoes is the location of the bites. A mosquito can and will only bite you where your skin is exposed. Therefore, if you have bumps all over the side which was closest to the mattress, they are probably from bed bugs. Your reaction time can be another factor. If the bump is instantly visible and uncomfortable, you're looking at the aftermath of a mosquito's late night feast. Bed bug bites tend to develop more slowly, and some people may not even experience a reaction at all. Ticks are a hiker's worst enemy. Sitting on top a blade of grass, waiting for an unfortunate explorer to wander by to attack. These are almost invisible until they're attached and swollen from the feeding. Unless you experience tightness or itching in the area, the only indicator is the small black tick sitting in the middle of a red bump. However, sometimes the tick will decide to let go before the area swells too much, but the bulge remains. This bulge can resemble a mosquito's bite. It will likely itch and feel uncomfortable, marking the area with a firm reddish bump. Yes, spiders. This does not include all spiders, as some will cause huge ulcers on the skin's surface which can be incredibly painful. However, others will produce a reddish bulge, and sometimes blisters surrounded by a red area. These spider bites may look similar to a mosquito bite, but the sensations are far from the same. On closer inspection of a spider’s bite, you may see two puncture marks, side by side. Mosquitoes are very subtle when they bite. Spiders, on the other hand, can be vicious. The initial pain will likely tell you that it wasn't the blood-hunting pest and you should seek medical advice right away. While flea bites are not the closest cousin to mosquito bites, they do bear some resemblance. Small red bumps or dots will usually appear around the ankles. Within a couple of hours, these generally swell up, sometimes creating blisters or open sores. The dots will likely itch and feel uncomfortable, as with mosquitoes. Mosquito bites are generally well- known. We come across them every summer. But in saying this, it’s essential to have some basic knowledge so you can identify if it could be something more serious. You also need to know when the reaction from a mosquito bite is serious enough to consult a doctor. Hopefully, through this short guide on what mosquito bites look like, you're able to sit in confidence around the campfire with your legs in shorts, enjoying the summer weather.